Day 7 of the Egg Fast. I did it! Predictably, I gained 1/2 pound this morning. It’s ok. You always gain at least a little when you come off any kind of fast. 90 – 100 oz of water doesn’t seem so bad anymore. That’s certainly a positive from doing the egg fast! Do you have a favorite egg fast recipe? Let me know in the comments! Today was Day 5 on the egg fast. When I started this, I really had doubts about whether I would finish the full 5 days! The timing was right though and really, it wasn’t that difficult. I do enjoy eggs in all their many forms so I’m sure that helped. I weighed again today and stayed the same as yesterday. I was a little bummed, and then my dear hubbie reminded me…that’s why I don’t weigh every day! Weight fluctuates and the scales are not really our friend. I mean, there is so much more to this way of eating, to how I feel about myself, to my health, and to life in general than what the no good son of a gun scales say. If you haven’t watched the video by Bob Briggs about the scales, here’s a link to it: That Lying Cheating Dream Crushing Scale. It’s a good one! By the time I go to bed, I’ll have had almost 100 oz of water. Part of it was a bottle of Sparkle Ice lemonade flavored water. Tomorrow is Day 6! I’m looking forward to gradually adding in some other low carb foods from I Breathe I’m Hungry’s Five Day Egg Fast Days 6 & 7. Everything I’ve read about doing an egg fast says it’s important to come off the fast gradually, so you don’t immediately gain back the weight you’ve lost. I sure don’t want that! Have you done an egg fast? How did you feel? Did you gain much weight back? I’d love to hear from you in the comments. Last Friday, my brother Matt and I had the special task of taking our Mother to the hospital for cataract surgery. We’re so thankful for her doctor, anesthesiologist, and nurses for their skillful, kind, and thoughtful care. Mother came through just fine and is on her way to better vision. Yay! The best part about the day – besides having the surgery over and behind her – was getting to spend time with Mother and Matt. Dedicated time to visit, laugh, and reminisce. After we got her home and settled, we started talking about some old photos Mother had recently put up on Facebook. There are photos of my brothers and me when we were children, our Dad (who has been up in Heaven for over 26 years), and of course photos with Mother in them when she was young. We got to talking about things that we all remembered and things long past that only she remembers. Mother told us how when she was young her mother went to work and she had to start cooking for their family of ten. How their Sunday fried chicken dinner was made with the chickens their dad purchased and butchered on Saturday the day before. How that chicken tasted so fresh and good! How she or her sister baked two pies every Saturday that were eaten after the chicken dinner on Sunday. How during the week, they mostly ate vegetables because meat was too expensive to eat every day. I could go on and on! It was wonderful and I hope we make opportunities for these kinds of stories and memories more often. 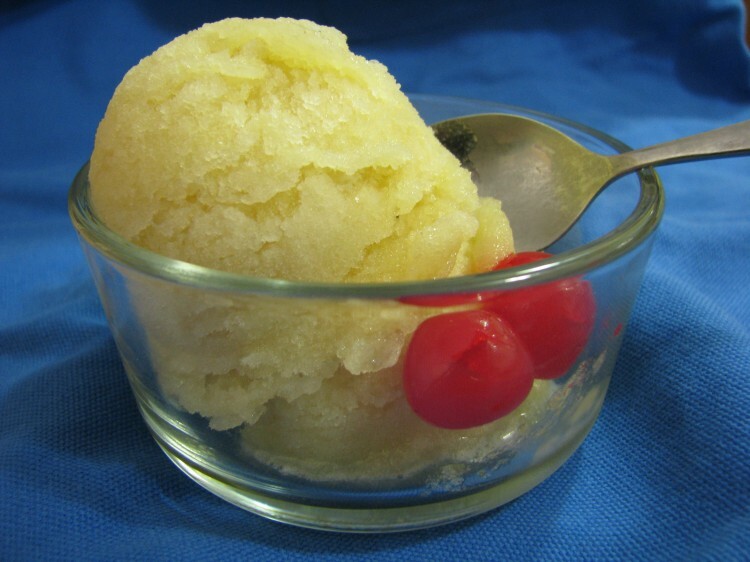 One of the recipes that we all have in our memories is Three Fruit Ice. Everyone in our family loves it and thinks of it as a special treat! My Grandma would mix up the ingredients and put it in a crock in the freezer. After it had frozen hard, my Mother or one of her siblings would take a knife and chip away at it until they could scoop it into bowls on a hot summer day. My brothers and I, and all our cousins, have passed it down to our children. Three Fruit Ice is more than just a memory. It has definitely become a family tradition! Original instructions: Mix all the ingredients and freeze solid. When ready to serve, chip away at the “fruit juice cube” and serve. My instructions: Put the orange juice, lemon juice, bananas, sugar, and some water (if there’s room for it) in a blender and blend until well-mixed. Pour into a large bowl and mix in the rest of the water. Put in the freezer, stirring every so often to keep it icy but not frozen solid. Serve with a maraschino cherry for garnish, if desired. Take time to reminisce and to celebrate family traditions. Maybe you’ll make some new memories and family traditions along the way! Categories: Faith, Food, Ice Cream and more! | Tags: cooking, food, fried chicken dinner | Permalink.